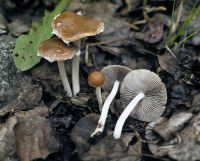 Psathyrella piluliformis is a most variable fungus characterized by its clustered growth on dead hardwood, hygrophanous cap which is dark red-brown when moist and yellow-brown to ocher-brown when dry, fragile flesh, and white ring-less stipe. Microscopically, it can be identified by the combination of rounded to obtuse cystidia, small spores (4.5--6 x 3--4 µm), and hyphae of the cap flesh that are dark cocoa-colored when mounted in potassium hydroxide. P. hydrophila is a probably better known name for the same species. P. spadicea is similar, but more robust and grows in clusters of fewer individuals, not approaching the sometimes large masses characteristic of P. piluliformis. 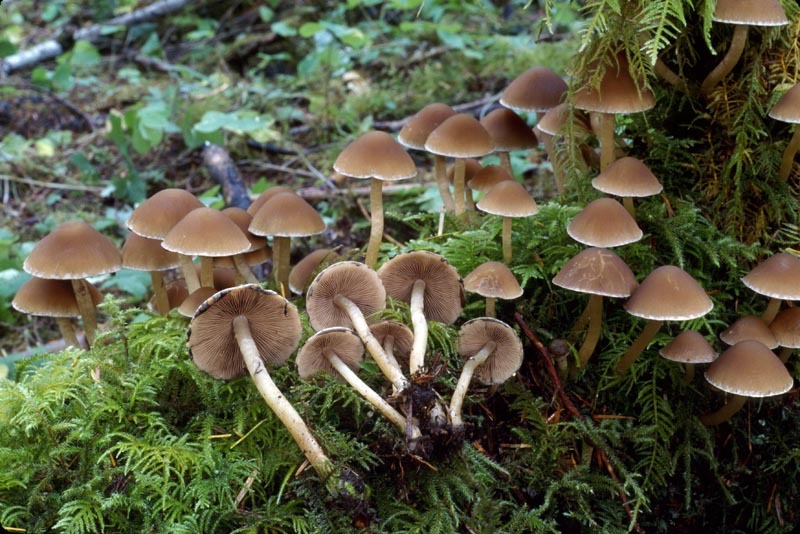 P. multipedata also grows in clusters, but they are much tighter and the individual mushrooms arise from a common root-like base that extends deep into the substrate; it also is duller in color and has larger spores (6.5--9 x 3.5--4.5 µm). 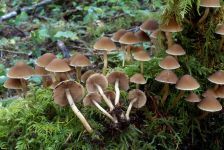 Little information concerning the edibility of P. piluliformis is available; however, given the fragile texture and thin flesh of the mushrooms, they are unlikely to be good candidates for the pot, even if they can be confidently identified. PNW Herbaria: Specimen records of Psathyrella piluliformis in the Consortium of Pacific Northwest Herbaria database.